I want to start this post by saying that I am not anti ageing - I believe that ageing is a privilege. That being said, I like to keep my skin looking as plump and youthful as possible. I personally don't have botox or fillers but don't judge anybody who does have those treatments - never say never, but for now I am happy to keep the signs of ageing at bay with effective skincare products. I want to keep my skin looking its best for as long as possible and so far, so good. Today I want to share some hero products with you - products that actually make a difference and are worth the money. This is going to be quite a long post as I have lots to share with you! As the saying goes, prevention is better than cure so SPF is essential and something we should wear daily. My personal preference for my face is La Roche Posay Anthelios but I think that everyone needs to find their own SPF as so many can clog pores and break you out so once you find one that works for you, then stick with it. I have dry skin so I use the comfort version of the SPF but they also have a gel cream version, which is more suitable for oily or combination skin. It's also very important to use it on hands daily because hands and neck can show signs of ageing more quickly than other areas and are often neglected. The other two essentials are sleep and water; both of which make a massive difference to the skin and aren't very expensive. I think that most people start to see signs of ageing in the eye area in the form of fine lines but a good eye cream can make a visible difference. I know that a lot of people say that they can't tell if an eye cream is worth using as they don't see any difference but, in my opinion and experience, when you find a good eye product, you can see the difference quite quickly. The key is finding one that addresses your specific concerns but that isn't too rich for your skin as that can cause milia (those annoying white bumps that can appear in the eye area that are tricky to get rid of). I have three eye products that most certainly make a difference to the under eye (I don't use all three at the same time so it's only necessary to have one of these): Estée Lauder Advanced Night Repair Eye Concentrate Matrix, La Roche Posay Redermic R Intensive Anti-Wrinkle Concentrate and VENeffect Anti-Aging Eye Treatment. The applicator on the Estée Lauder product is awful but the product itself is amazing. It has a serum texture that sinks into the skin immediately and it feels quite cooling. I apply this nightly and the result is smooth, plump skin that makes me look well rested even if I'm not. Skin looks firmer and smoother and as a result, I find that I need less concealer. The La Roche Posay product is perfect for both morning and night-time use. It has a light creamy texture that packs a punch in terms of hydration yet it doesn't feel greasy or leave a film of product on the skin. It is ideal for under concealer, particularly full coverage options because it doesn't make them break down but it also prevents them from caking due to how hydrating it is. Regardless of whether makeup is being applied afterwards, this eye cream is brilliant for every day use as it plumps the entire under eye area, diminishing the appearance of fine lines. I have reviewed the VENeffect product in full here but a quick summary is that this is the créme de la créme of eye products. Only a tiny amount is required per use and this light textured lotion firms, nourishes, soothes and repairs the under eye area. I feel like it has taken around 5 years off my under eyes as the area is plumped so much that fine lines are barely visible, also it can be used on the eye lid and I feel that this area is firmer and less puffy, which is no mean feat as the high temperatures we have been having would usually make my eyes look puffy. It's expensive but worth every penny. Lip balms are great for moisturising the lips but to ensure that the skin around the lip area is nourished, a lip treatment is ideal. I used to apply my eye cream to the lip area - Dermalogica had an eye cream that was recommended for both the eye and lip area, which got me into the habit, but VENeffect Anti-Aging Lip Treatment is designed specifically for the lip area. It is a cream, rather than a balm and is applied all over the lip area, not just on the lips. Smokers, in particular, should use a lip treatment as signs of ageing are visible more quickly in this area when you smoke. That being said, we will all show signs of ageing eventually so this treatment is ideal for everyone. It doesn't feel at all greasy and doesn't interfere with any subsequent lip products, in fact, if anything, it prevents any signs of lipstick bleeding or feathering. I use it as part of my skincare regime both morning and night and also throughout the day, if needed. It has been particularly beneficial over the past 6-8 weeks where we've had high temperatures. My lips haven't looked or felt flaky or dry once and I have found that my lipsticks apply very evenly after using this lip treatment. I personally like to invest more in my serums than moisturisers as they are more effective and work harder than anything applied afterwards, in my experience. A product that I recommend to everybody is Estée Lauder Advanced Night Repair - it has been a staple in my routine for over a decade. This product doesn't give instant results but over time, you will notice that skin is firm, smooth, glowing, hydrated and rejuvenated. For me, this product is non-negotiable and it will be forever repurchased. Another product that I like to use at night is Sarah Chapman Overnight Facial, which is basically like a facial in a bottle. This serum-oil hybrid is packed with skin-loving ingredients: anti-oxidants in the form of Vitamins A and C, omega oils, Co Enzyme Q10 and essential oils of jasmine, rose, tuberose and frangipani. The morning after applying this, I wake to dewy, hydrated, bright and smooth skin. It is ideal to use the night before a special occasion and is a product that I think all brides should use in the lead up to their wedding - as long as you aren't sensitive to essential oils that is! It is expensive at £49 for only 15ml but only a few drops are required per use. Lookfantastic have weekly discount codes so keep an eye there if this product grabs your attention. (Not sponsored, I just like to share savings when I find them). Hyaluronic Acid is a powerful ingredient because it attracts and retains up to 1000 times its weight in moisture. All skin types will benefit from using products containing hyaluronic acid and the serum that I highly recommend is IMAGE skincare Ageless Total Pure Hyaluronic Filler, which I reviewed in full here and you can win here. This product contains six forms of hyaluronic acid, which gives instant and visible results in the form of plump, smooth and hydrated skin but with long term use, skin looks more youthful - fine lines are diminished completely and even the tricky nasolabial fold is plumper. As a result, makeup applies very evenly and doesn't cake at all throughout the day. I also find that I need less primer as my skin is more nourished and plump overall. Don't miss your chance to try it for yourself in my giveaway here. 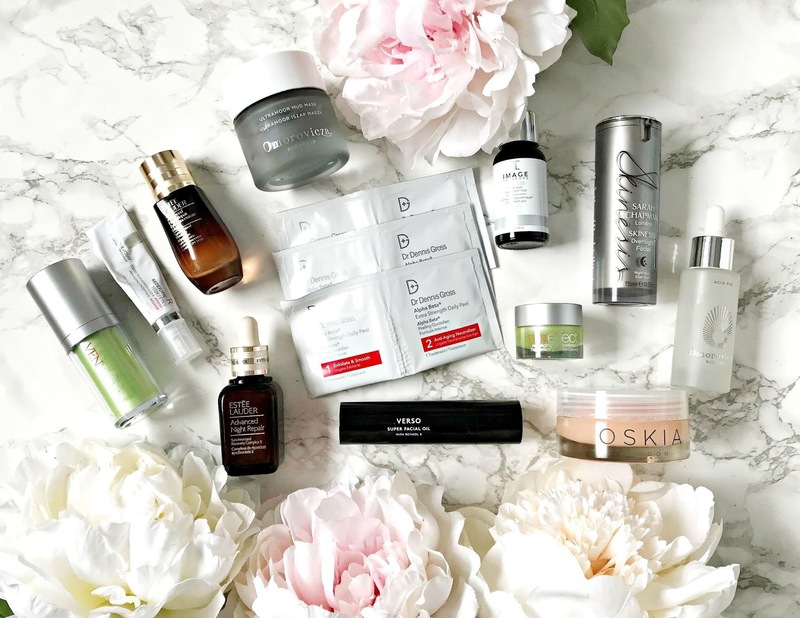 Acids are game changers when it comes to anti-ageing. Alpha Hydroxy Acids include glycolic acid, lactic acid, mandelic acid, malic acid and more. These acids exfoliate and renew the tops layers of the skin. Beta Hydroxy Acids, such as salicylic acid and citric acid, can penetrate the skin more deeply and are oil soluble, making them perfect for acne prone skin, however BHAs are beneficial for all skin types when paired with the right ingredients. Omorovicza Acid Fix combines AHA and BHAs but it is suitable for even the most sensitive skin as it contains Omorovicza's patented Healing Concentrate (which is in all of their products). This concentrate ensures that skin is soothed and not irritated by the other active ingredients. A few drops of this patted into the skin at night ensures that skin is renewed, smooth and bright. Those pesky little under the skin bumps that can appear along the jawline, are eradicated with this serum and the top layers of the skin are renewed to reveal bright, glowing skin. Acid Fix helps to reverse the signs of sun damage and it also hydrates the skin. Another product from Omorovicza that I would recommend is their Midnight Radiance Mask, which I have used three pots of already. This mask is applied at night and has a gel texture so you will feel it on the skin but I don't find that it sticks to my hair. It contains salicylic acid but also contains hydrating ingredients so it doesn't dry the skin out. The results are visible the morning after use - skin is almost translucent, is plump and smooth. It is definitely one of the best skincare discoveries I have made in the last 12 months. A powerful acid product that can be used daily is Dr Dennis Gross Alpha Beta Universal Daily Peel. These pads contain a blend of five AHA & BHAs so they are extremely powerful and effective. Step 1 is the peel pad that is swiped all over the face - I particularly concentrate it on any stubborn areas of dryness, pigmentation or blemishes. I then wait two minutes before applying Step 2, which balances and rehydrates the skin. The result is smooth, even skin with pores looking less visible. I find that these pads repair the skin, help to fade blemishes and pigmentation, make my skin feel very smooth and look brighter all at once. I personally don't use them daily as they are quite pricey but at least twice a week, I will use them as part of either my morning or night routine. Cult Beauty have free shipping on Dr Dennis Gross products for the month of July and they have a pack of five treatments available for only £16.50, which is a good way of trying the product without investing too much. Again, not sponsored but I wanted to share as free worldwide shipping is always a good deal! If you are a regular reader of my blog, you will know that I describe Omorovicza Ultramoor Mud Mask as Spanx for your face! (See post here) This mask instantly lifts and firms the skin whilst also deeply cleansing, decongesting and refining pores and soothing the skin. The result is radiant, firm plump skin. Oskia Renaissance Mask is another really effective mask. It contains fruit acids and lactic acid, which combine to exfoliate the skin leaving it luminous, smooth, soft and hydrated. Both of these masks have been repeat purchases for the last 2-3 years because they give immediate and visible results. Retinol is the only proven anti-ageing ingredient but what makes Verso products unique from other retinol products, is its patented Retinol 8 complex, which is right times more effective than regular retinol products. The entire line is very effective in terms of anti-ageing, which I have discussed in depth in this post. I have a full review of Verso Super Facial Oil coming later this week so I won't elaborate too much in this post but suffice it to say, this oil is basically the elixir of youth! It is expensive at £150, however it will last almost a year and you can save 25% on it by using the code BBUKPRO25 at the checkout on MMCLPro. Come back later in the week for my full review! If you have made this far, thank you! I really hope that this post and the recommendations in it will be of benefit to you. Have you tried any of these products? I would love to hear what your anti-ageing heroes are! All products are bought by me, unless otherwise stated. The Verso oil, Image serum and VENeffect products were kindly sent to me. Opinion is always my own. Affiliate links may be used.